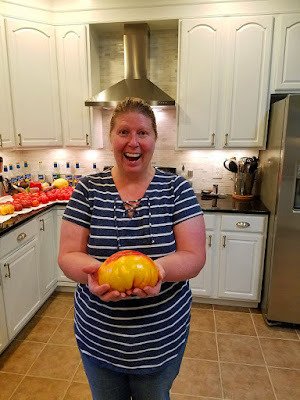 It's that time of year again to taste-test and compare some of the heirloom tomatoes I've grown in the garden. 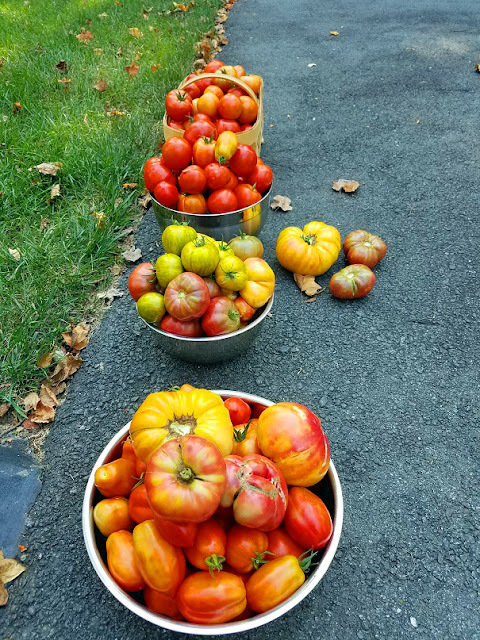 Every year I like to grow different varieties to see what's-what, but very few actually make it back to take up valuable space in the garden beds. This year, I grew "Black Krim," "Green Zebra," and "Gold Medal" along with my standby ultimate favorite heirloom "Brandywine Sudduth's Strain". 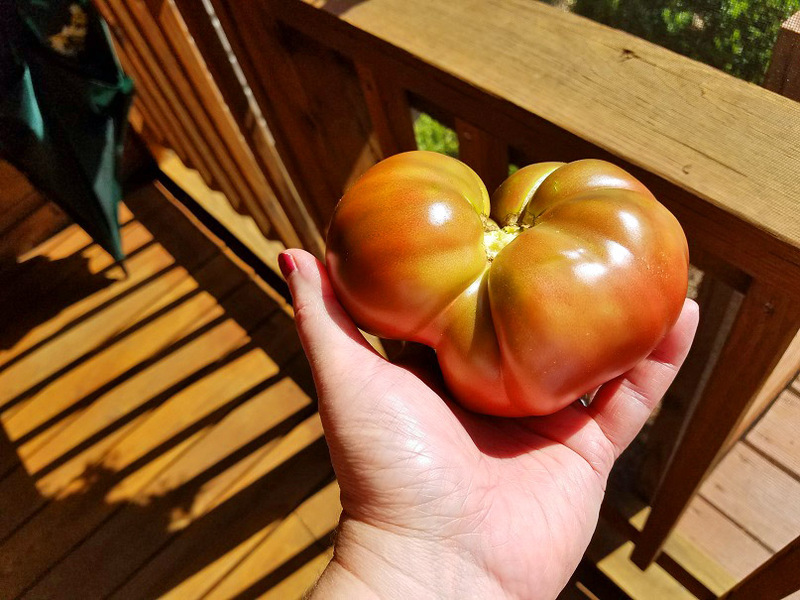 "Black Krim" is a deep purple beefsteak tomato that is supposed to have a deep, rich, almost smoky flavor. 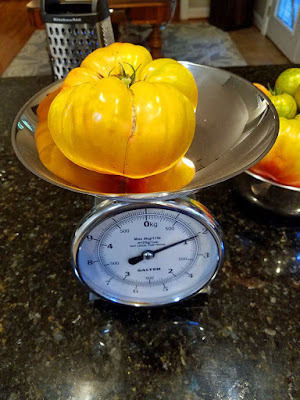 This heirloom wins tomato-tasting contests all the time, so I had to give it a try. The plants were productive and the fruit beautiful; however, I wasn't impressed. I found it to be mild, slightly sweet, lightly acidic, and it did have a very slight smokiness to it. This is a good tomato if you have issues with eating acidic foods. I think "Black From Tula" is a better-tasting purple beefsteak. "Green Zebra" was a wonderful surprise this year!. It's a small, plum-sized, green-striped tomato that is said to have a bright, high-acid, almost "citrusy" flavor profile. I've read that this tomato is amazing sliced on top of a crab-cake sandwich. It's flavor description is spot-on, as well as having a nice depth of all-over-tomato-flavor. Since this is a green tomato, I was confused/concerned as to when to know when to pick it. 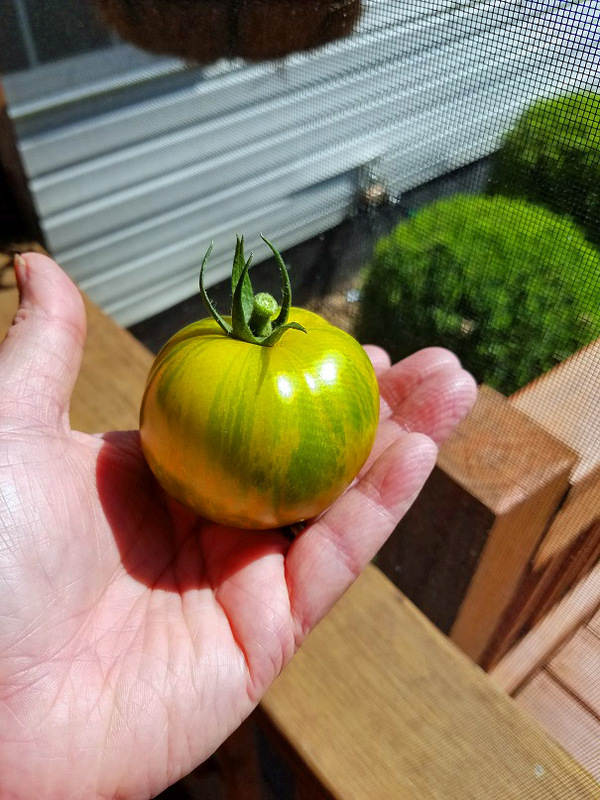 Luckily for me, the variety that I grew turned its stripes yellow when it was ripe. The only issue with this tomato was I noticed it had a tendency towards blossom-end rot, even when given bone meal at planting. I've never had this issue w/my other tomatoes, so it's something to keep in mind. The 2-3 plants I had only had a few fruit that got BER, so it wasn't too bad. This is a keeper tom for sure. We loved it. "Gold Medal" tomato is a hearty, yellow/blush, beefsteak tomato that is quoted to be "the sweetest tomato you've ever tasted," and boy were they right! It's definitely sweet...almost too sweet and I prefer my tomatoes to be on the more savory/acidic side. It's a mild (almost watered down, IMO) tomato, lightly acidic, and would be great for people who are watching their acid intake. 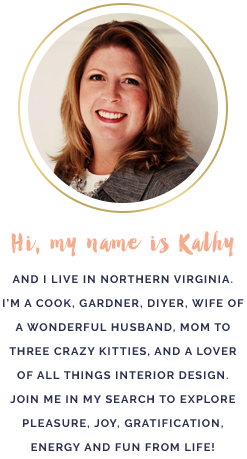 But talk about being super fun to grow! Check out this 2 lb. monster I picked from one of my plants! Almost all of the fruit from this plant were this size. In fact, I'm going to enter my tomato in our local paper as the largest tom and see if I win! As far as yellow beefsteaks go, I much preferred last year's "Mr. Stripey" for flavor. This summer has definitely kept us busy. Our late, cool spring allowed our plants to set extra fruit and I think we are at about 150 lbs picked so far. 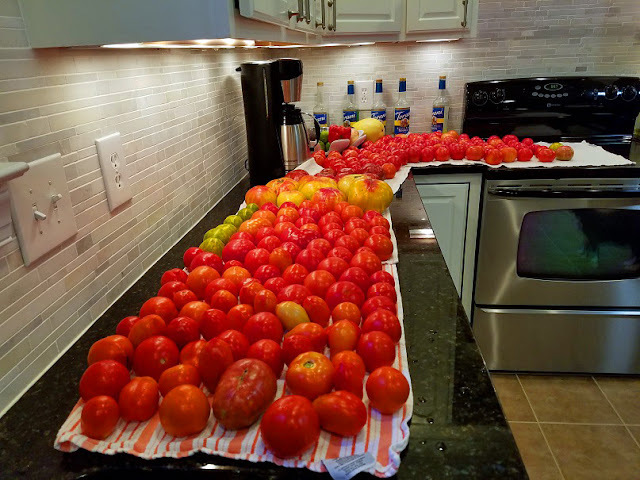 I'm done with canning tomatoes for the season. No more! After this, it will be Herbed Roasted Tomatoes, Tomato Basil Butter, and giving what's left away to friends and neighbors.